You may have heard of most of these before but that doesn’t mean you are actually doing them! Take a good hard look at what you are currently doing and decide where you can CUT some calories. Some of these are easy as long as you are committed! Quit drinking your calories. This includes milk, juice, alcohol, sweetened tea and coffee with sugar and cream. Eat more often. That’s right, if you are going too long in between meals, you are probably overly hungry and eating too much. Switch to leaner proteins. Poultry or fish instead of red meat. Skim or low fat milk and dairy instead of whole. Beans, legumes, nuts and seeds work well too! Add in produce. Every time you eat, make sure it includes a fruit or vegetable. This will add volume and bulk without all the calories. Go Veg. Try to make 2 lunches and 2 dinners each week vegetarian. Meats can be high in calories, especially for the portion sizes that we currently eat. Case in point, 8 oz of salmon (the size of filet you would buy or order eating out) is 440 calories. Use lower calorie condiments. Try mustard, ketchup, canola or olive oil based mayonnaise, vinegar, light oil based dressings, worcestershire sauce, light soy sauce, hot sauce, lemon/lime juice, horseradish, salsa, relish, herbs and spices for added flavor without the calories. And order all condiments on the side when eating out. Downsize. Use mini-bagels, pre-portioned yogurts or ice cream bars, order half size entrees or salads at restaurants and look for smaller fruits and vegetables at the grocery store. Look for easy ways to cut portions. Ditch the sugar. Look for unsweetened or lower sugar fruits, cereals, granola bars, condiments, etc. Leave 3 bites on your plate. You don’t have to finish it! And by starting with 3, you will realize that it is possible. Go fresh. Eat the whole food instead of the processed version: an apple instead of applesauce, chicken breast instead of the chicken nugget, plain yogurt instead of flavored yogurts. Bake lighter. Anytime you are baking, cut sugar by 1/2 and fat by 1/3 and you will still get good results. Eat for volume. Start your meal with a broth based soup or a large salad. This will fill you up without adding calories. Get adequate sleep. If you aren’t sleeping 7-8 hours at night, your leptin hormone level may be lower resulting in weight gain. You’re also awake more hours which means more hours to eat! Stay hydrated. That way you won’t mistake hunger for thirst. Eat at home. Meals eaten at home are much lower in calories, fat and sodium and higher in fresh fruits and vegetables, lean proteins and whole grains. Be picky. If you don’t like it don’t eat it! Make sure it is worth it. Be assertive. Don’t be afraid to order food the way you want it. Some examples: order meats grilled “dry” (without butter or oil), steamed veggies without butter, ask for whole grain options, order condiments on the side. Be mindful. Quit nibbling on dinner before you eat it. Don’t take bites out of your kids’ food. Take the long walk around the office avoiding the candy dish. When you eat, make it count! Eat breakfast! You will eat less overall during the day by starting with a nice breakfast. So… it’s the holidays if you hadn’t noticed. 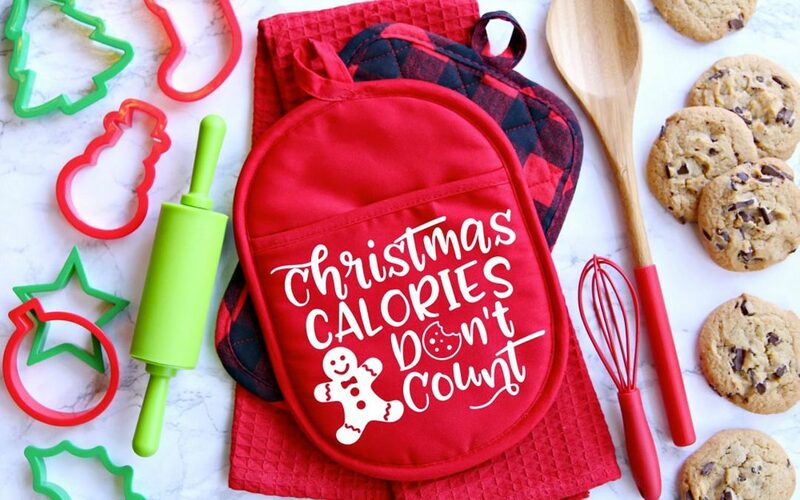 🙂 We wanted to share just a little sampling of calorie counts for some traditional holiday foods so you can see which foods are higher and lower in calories while planning your menus. Here is a sample meal for 800 calories. You can adjust if you would like to eat less but this is a reasonable amount for a holiday meal. On March 23rd, 2011, one year after President Obama included calorie labeling on menus as part of the federal healthcare overhaul, the FDA is to reveal the federal regulations for labeling menus with nutritional information. Keep your eyes peeled at local restaurants and vending machines to see how this plays out. There was some skepticism at first as to whether or not this proposal would impact the growing obesity rate. Would consumers understand what this information means and would they use it to make healthier choices? Research looking at states who previously implemented similar laws and have taken the matter into their own hands is conflicting. There are some outcomes that indicate a reduction in calories when information is available (mainly a shift in reducing calories by reducing portion size by choosing a smaller dessert or entree), however, the impact is not as big as we hoped. For a more in depth discussion of the new law, read this article HERE. You know that to lose weight, you have to burn more calories than you consume. However, very low calorie diets (800-1,000 calories per day) often fail because not enough calories are being consumed to fuel physical activity. This leads to a decrease in metabolism. These restrictive diets are tough to maintain and also trigger the body to suppress the Resting Metabolic Rate (RMR) by about 20%. This is purely a survival mechanism to increase efficiency by burning less calories to do the same amount of work someone adequately fueled could do while burning more calories. Also, eating carbohydrates provides a “protein-sparing effect”. Those individuals that eat too few carbohydrates would need to use some protein for energy rather than for building and repairing muscles. This explains why high protein diets result in so much weight loss, you are losing LEAN BODY MASS! Also, I am often asked about the decrease in metabolic rate with age. With each decade of life, RMR will drop 2-3%. This can be attributed to the loss of lean body mass due to physical inactivity. Fortunately, this loss can be minimized with regular resistance exercise. I will also add that recent research is showing “fidgeters” burn an extra 150-300 calories per day. So maybe start playing with your hair or tapping your feet! So what do you take from this? Eat adequate complex carbohydrates (5-7 servings per day) for energy and adequate high quality protein (70 grams per day) for muscle repair. Make sure to include weight resistance training in your exercise regimen. Eat adequate calories for your activity level and stay above 1,200 calories per day. As far as weight loss goes, calories is what is important. But for good health, which I hope you are all striving for as well, you want to make those calories count. The best way to help you do this is become an expert label reader. Here are a few tips to help you do that. What are the calories per serving? 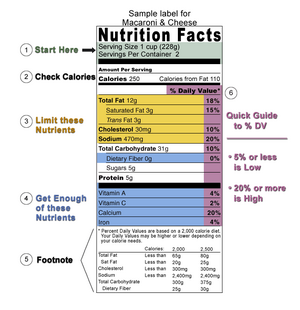 Nutrition: When choosing foods, the %DV listed to the right of the nutrient can give you guidance as to what is most, or least, nutritious. Notice the label above. The items in yellow are those you want to limit (fat, cholesterol, sodium). That means that the %DV should be less than 5% for each of these. The items in blue are those you want to make sure you get enough of (fiber, vitamin A, vitamin C, calcium and iron). For these items, the %DV should be 20% or more. Most products won’t have 20% or more of all the vitamins, minerals and iron but should have at least one or two. Again, balance foods throughout the day to meet these recommendations. Ingredients: This can be the confusing part for most people. The ingredients are listed by weight with the heaviest ingredient listed first. General rule of thumb, if the first 3-5 ingredients are questionable, find a different product or a different brand. Also, avoid anything with “partially hydrogenated oil” listed in the ingredient list. Make sure to read the label for these and put it back on the shelf if it has it! Grains: The first ingredient should have the word whole in it. If it says enriched or bleached or even just wheat flour, corn flour, etc…it isn’t a whole grain. Don’t trust packaging that says “nine-grain” or “Stone Ground Wheat”, make sure to look at the ingredients. Also, look for fiber to be 5 grams or more per serving and sugars to be less than 6 grams per serving. Fruit: Buying fresh or frozen is the best choice. However, when looking for canned fruit, dried fruit or fruit juice, read through the ingredient list and make sure there is no sugar added. 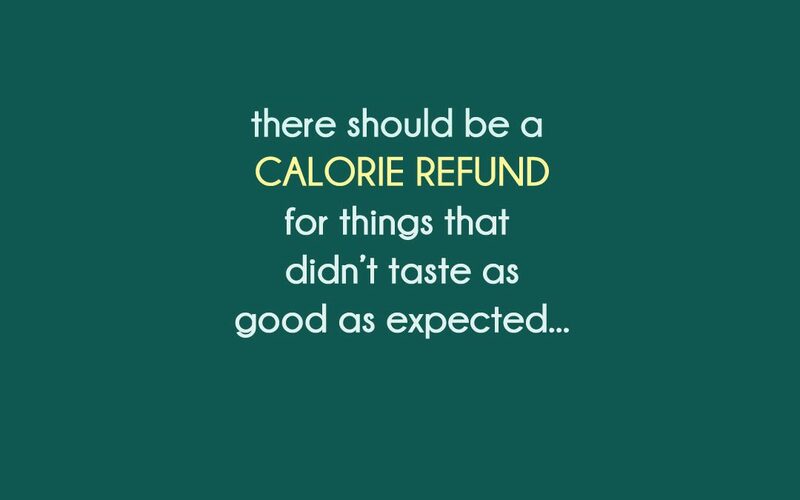 These calories can add up fast! Also, limit fruit juices to 4 oz (1/2 cup) per day. You will get much more fiber in less calories with less added sugar in fresh or frozen fruit. Milk: Low fat or fat free is the way to go. You will eliminate most or even all the saturated fat and cholesterol found in animal products and will be left with the calcium, riboflavin, vitamin D, potassium and vitamin A found in dairy product. Make sure to choose skim milk, 2% cheese (or feta, parmesan and goat cheese since it is naturally lower in fat), fat free cottage cheese and yogurt. Stay away from fat free cheese since we start to wonder what it is made of. Most of the ingredients in these products should be straight forward. If not, find another brand. Buying organic is also an option! Vegetables: Fresh and frozen is best! Try to limit canned vegetables, first for palatability and also for nutrition. Canned vegetables do maintain their nutrients but they are high in sodium. Look for low sodium vegetables and beans and rinse them to remove up to 30% of the sodium. Meat: following is a list of the best cuts of each type of meat. Look for skinless, boneless poultry and fish most often and limit read meat (less than 2 servings per week). Poultry: skinless, boneless turkey breasts and chicken breasts. Thighs and wings are higher in fat as well as other poultry products such as duck and goose. Also, trim all visible fat. Fish: Fish that is lighter in color is lower in fat. Fish that is firmer and darker such as salmon, mackerel and bluefin tuna are fattier fishes but also have more omega-3 fatty acids. Try to eat fatty fish 2-3 times a week. Fats: This is where a list of ingredients comes in handy! Make sure to choose reduced fat options for most but don’t go to fat free because that is where we get a lot of additives, preservatives, and chemicals. Reduced fat products will have added natural soluble fibers (pectins, gums, mucilages) but that is just to improve the texture once the fat is taken out. Aim for monounsaturated fats most often (olive oil, canola oil, olives, avocados, and nuts – walnuts and almonds especially). Look for canola oil mayonnaise, canola oil based tub “margarines” such as Canola Harvest, olive oil vinaigrettes for salad dressing, use plain non-fat yogurt for sour cream and limit solid fats such as butter, lard, shortening, and stick margarines. If you have any questions about any of this, leave it as a comment and I will answer it. Label reading can be tricky but if you can get the hang of it, it will save you every time! Traditionally I would be out on the morning hike right now, but for whatever reason my blister is ignoring all treatment and continuing its growth pattern. So I decided to blog about yesterday. Yesterday the soreness in my muscles had nearly subsided, so I decided to push myself to new limits. I did the morning hike, at least 3 miles of it, and burned over 800 calories. I was really looking forward to the afternoon classes — circuit training and kickboxing. Circuit Training is 30 different stations of cardio and weight machines (treadmills, ellipticals, bench press, leg press, etc). They give you two minutes on each machine to go as hard as you possibly can to get your heart rate up. I love this class and hate it at the same time…it is non-stop and Sharon, the instructor, really pushes you to your limits. I burned 1400 calories in this class. Kickboxing is great for anger management — all that punching that I wanted to do in previous days came in handy during this class. These two classes brought about new soreness that I am now popping Advil for…but it is a good sore, right? In the evenings we have lectures from different specialists on a variety of topics. Last night the Movara resident nutritionist Emily Fonnesbeck, gave us some great information on portion sizes and how to spend our calories wisely. Emily really knows her stuff and the lecture was enlightening. I didn’t realize how many calories I consumed each day before arriving here! Well, I am off to ride a bike or something….gotta burn some more calories!